Over the past few months, we have been able to attend some awesome events in the area! If you are a school or school vendor in the Kentucky-Ohio-Tennessee tri-state area, you need to check out these associations and plan to attend their events in 2016! The Tennessee School Boards Association was created with the goal of assisting Tennessee school boards in effectively governing school districts. On their website, they have a detailed list of the ways that they plan to realize this goal in 2016. Some of those ways include seeking 100% membership of all school boards in Tennessee, providing professional development opportunities for all employees, providing each school board member a TSBA calendar of activities and events, reviewing and revising roles and responsibilities for TSBA staff to meet the changing needs of school boards and maintaining e-mail addresses of all board members and superintendents. Their convention is one of the largest education meetings in Tennessee where public school advocates and board members come together from across the nation to showcase successful student achievement programs and discuss new trends and innovations in education. There's no doubt that you will benefit from being a part of this organization. If you are ever in need of something for your school, TSBA is able to connect you with the right professionals to handle your concern. At Toadvine Enterprises, we are happy to provide all of the sports facility needs to Tennessee schools! 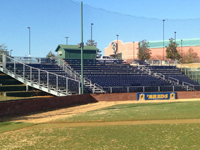 Please contact us if you have any questions about athletic equipment, seating or scoreboards! Someone from our staff with respond to you within 24 hours! Every year Toadvine attends the Ohio School Board Trade Show to network with people and discuss new ways of how we can better serve the school children in our area. 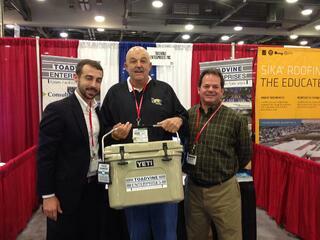 We met some awesome people this year, learned some really cool new industry trends and gave away a free cooler! The Ohio School Board Trade Show is one of the biggest--if not THE biggest--school trade shows in the U.S. If you are a school or vendor in the area, or even on this side of the country, you should definitely consider attending this event next year! They are all about coming up with practical solutions to help school district teams improve student learning and achievement. The event aims to bring excellence to the education experience as a whole, including sports, arts and health. It is also a great opportunity to network with people in your industry! We met some awesome architects this year who we hope to partner with to do business in the future. 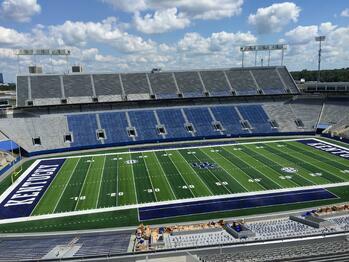 As we said before, please don't hesitate to reach out to us if your school needs a new stadium. Contact us here! And we hope to see you at these events next year! In a recent Business First article, Tom Jurich, the director and president of athletics for the University of Louisville, talks about the importance of having state of the art facilities in order to recruit the best athletes to your school. 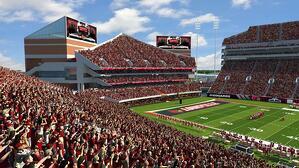 A couple of weeks ago he announced his plan to expand the Cardinal stadium by 10,000 seats. The new design will mimic NFL stadiums, namely the Seattle Seahawks' CenturyLink Field and the Dallas Cowboys' AT&T Stadium. 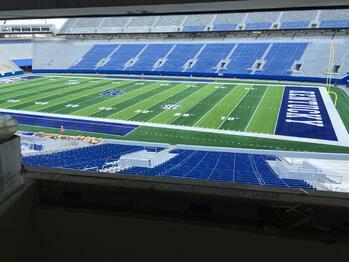 Locker rooms, training rooms and meeting rooms will be revamped as well in this $55 million renovation. A member of the University of Louisville Board of Trustees, Jonathan Blue, expressed his support for the project by saying, "Today, sports is an arms race, especially in recruiting, and we must have top-notch facilities in order to bring top-notch athletes to this university." Jurich is also thinking about the fans. He is putting together a committee to find out what fans are wanting to see in the new stadium, and a new team entrance is being built so that fans can cheer on their team as they emerge from the locker room at the start of the game and at halftime. Whether you are the athletic director for a small high school or president of athletics for a D1 university, your players depend on you to keep their stadiums and equipment in optimum shape. It truly does affect performance and team morale. 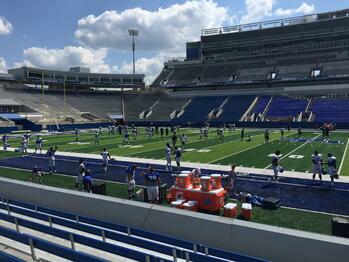 Similarly, the fans are affected by the way you maintain the equipment, seating areas, scoreboards, etc. 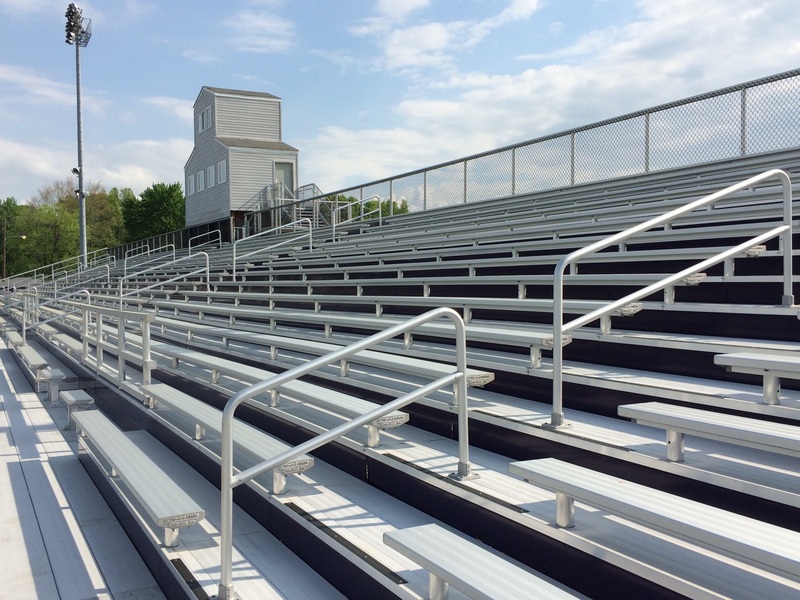 At Toadvine, we provide the best of the best in athletic equipment and would love to help you step up and prepare your stadium for the team you represent. Contact us here and receive a 24 hour guaranteed response or visit our website to check out some work we have done.